NAHA Wi-Fi at the access point in Naha which approximately 300 places is available for free. 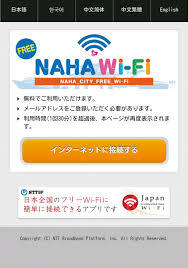 Naha City, offers free public wireless LAN service of “NAHA CITY FREE Wi-Fi” for the purpose of convenience such as improvement of tourist and coming town’s. The access point, public transportation such as Naha Airport and Okinawa urban monorail station, Shuri Castle and cultural facilities such as shikina-en, Kokusai Street and Makishi tourist attractions, such as the first public market, the city’s souvenir shops and eateries such as, it offers a service to the center a major tourist area. 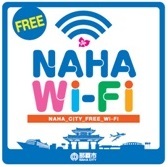 The “Wi-Fi” from the “Settings” on your device is turned on, and then select the “NAHA_CITY_FREE_Wi-Fi” from the network list. When you start the browser, you will see the connection guide screen automatically. Please operate according to the screen instructions. ※ initial display, it will be displayed in Chinese (Traditional). Please switch to the Japanese click the language selection tab at the top of the screen. User registration is valid for one year. This service, Naha is a communication skill in the art to which consignment NTT Broadband Platform, Inc. (hereinafter, NTT-BP) has been using the Internet connection function provided by. This service, including tourists from overseas, everyone so that the able to use easy to contact, we do not do wireless encryption using WEP and the like. Therefore, if you have a user who has malicious intent, communication contents of the radio section (section from the terminal to the access point) is intercepted, likely to be prying eyes entered ID and password, personal information such as credit card number there is. Purport we understand, so that if you use this service is the responsibility of the users themselves, thank you. 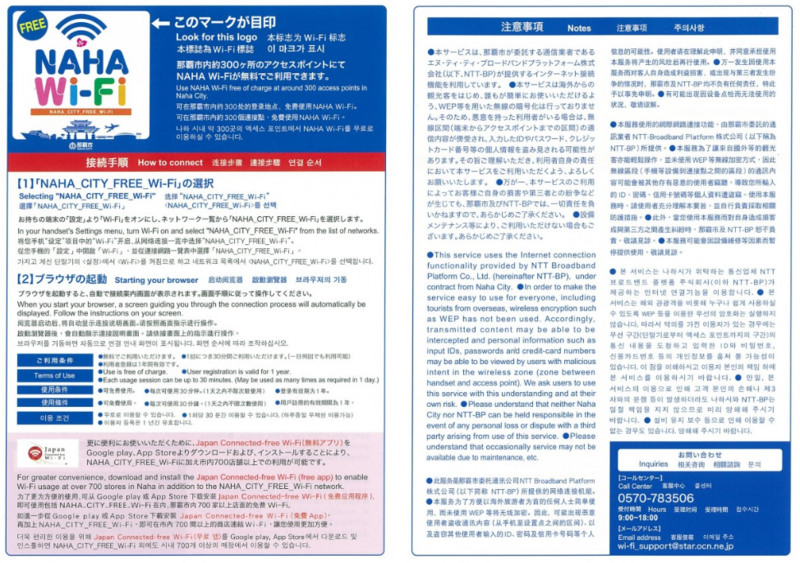 By any chance, even by the use of this service occurs, such as a dispute with your own damage and third party, in Naha City and NTT-BP, so can not assume any responsibility, Please note. By equipment maintenance, etc., and it may not be available. Please note. easy connection to Japan of free Wi-Fi spot! 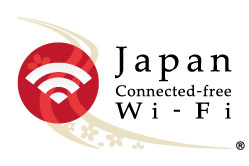 Japan Connected-free Wi-Fi is an application that can be easily connected to the free Wi-Fi in Japan. Convenience stores, airports, available station, tourist facilities and the like. Japan Connected-free Wi-Fi (free app) the Google play, by downloading from the App Store, you can use in the in addition to the city 700 shops or more NAHA_CITY_Wi-Fi.